For the recordings of Evolution of a Revolution, Ky-Mani spent many weeks at the famed Tuff Gong Studios in Kingston, Jamaica – the first time he has recorded there. 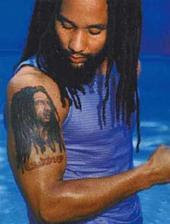 Ky-Mani Marley is a singer, actor, author, and humanitarian. He has four albums to his credit. In 2009, Ky-Mani started the Love Over All Foundation (L.O.A.F.) which is dedicated to the educational development of the youth by creating programs and distribution of grants that help promote positive change in low socioeconomic communities. Ky-Mani and Julian Lennon were jointly named Philanthropist of the Year by Prince Albert II of the Monaco Foundation, Better World Awards. Ky-Mani released his memoir Dear Dad through Farrah Gray Publishing on February 6, 2010, what would have been his father Bob Marley’s 65th birthday. Tickets available at The Independent for no service charge. Previous postCD Review: NiyoRah, Feel Your Presence Next postWin Ragga Muffin Festival Oakland Tickets!